It is the time of the year when many people get nervous about winning and losing. Students are cramming hard to pass entrance exams to get into the high schools and colleges of their dreams. Their families and friends watch their words so as not to demoralize them, going out of their way to avoid using phrases such as suberu (slip), ochiru (fall) and korobu (tumble). Food companies market limited editions of special snacks and sweets, using puns and special packaging to style them as “good luck” charms for exam-takers. 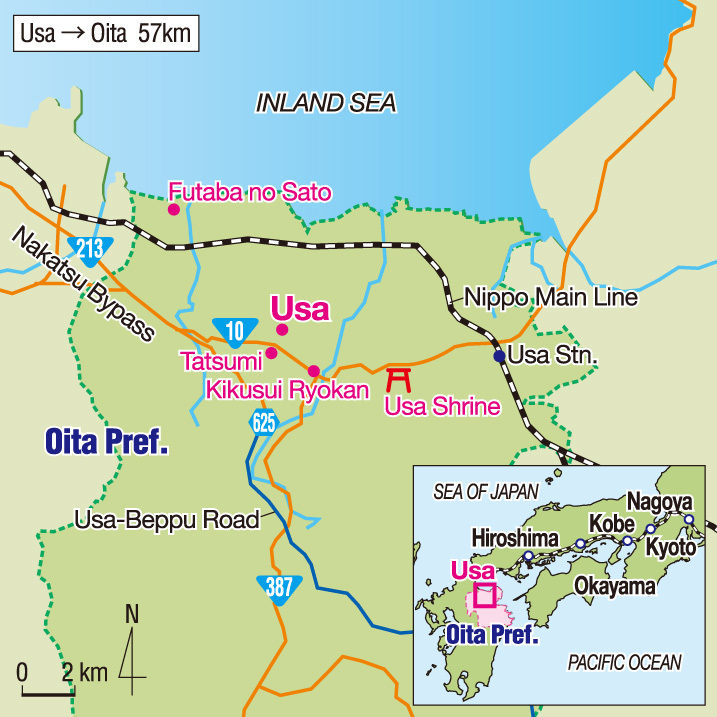 So when I recently received an offer from the government of the rather obscure city of Usa, Oita Prefecture, in Japan’s southern Kyushu region, to visit the city and experience how kachi (victory) oriented the city is, I thought it might be worth investigating its claims. One of the first places I was taken to upon descending at Oita Airport was Futaba no Sato ( 33-5255; www.futabayama.jp/futabanosato), a museum dedicated to the late sumo champion Futabayama Sadaji (1912-1968), who was born and raised in Usa. Museum director Fumitoshi Shingai passionately recalled episode after episode surrounding the legendary wrestler, whose winning streak — 69 consecutive bouts between 1936 and 1938 — is yet to be broken to this day. Outside the museum, built by the city government in 1999, is a stone statue — which Shingai boasted is a “power spot.” The imposing statue bears the names and handprints of the three sumo wrestlers who have won more than 60 consecutive bouts; along with Futabayama, it features Tanikaze Kajinosuke, who recorded 63 straight wins between 1778 and 1782, and Mongolia-born Sho Hakuho, whose winning streak stopped at 63, matching Tanikaze’s, in 2010. “Visitors come here first and touch the handprints to get power,” said Shingai. Inside, visitors are greeted by a giant statue (1.5 times larger than life) of Futabayama standing fearlessly and imposingly in a mawashi (apron). Walking through the museum, it was obvious what great pride the city’s people have in Futabayama: A detailed chronology of his life covers the wall, while memorabilia, ranging from teacups to his drawing of a daruma (good-luck doll in the shape of Bodhidharma), fill the glass cases. The bigger “power spot” in Usa, however, is elsewhere. Built as early as 725, Usa Shrine ( 37-0001; www.usajinguu.com) has three major buildings enshrining not just one but three gods in its expansive premises and welcomes 1.8 million visitors per year. Not only that, the shrine, I was told, ranks as the most prestigious among a group of 40,000 Shinto holy places enshrining Hachiman-jin, the god of archery and war. 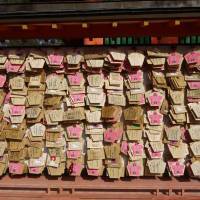 Thus the shrine has been popular among people wishing for good luck in their own “battles,” including entrance exams and qualification tests for doctors. Indeed, at the shrine I saw hundreds of wooden ema plaques hung on boards, on which visitors had left handwritten messages praying for victories, even putting the specific names of schools they were applying for. And unlike shrines in Tokyo, it comes with long sandō (entrance paths) and lots of mini-shrines and gates, surrounded by the woods. 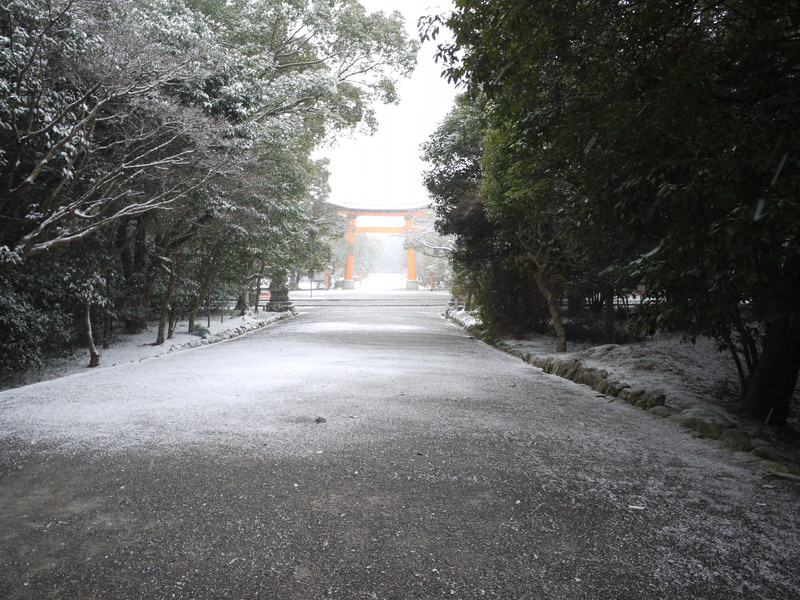 On the day of our visit, it suddenly started snowing, and though it was freezing cold, it added to the mystique and serenity of the shrine.